"Any reader seeking to honestly confront what the Civil War had become by 1864--and why Americans often avoid the hard truths about the war--would do well to consult this book." --Benjamin G./I>--Benjamin G. Cloyd "Journal of Southern History " "For the first time in nearly twenty-five years, the Second Battle of Petersburg gets its due in book form. Sean Chick takes a look at the four-day battle in June 1864 that could have ended the war in the east nine months sooner. Chick takes readers through the ebb and flow of battle, leaning on the official records but also drawing from a multitude of first-person accounts. The result is a solid battle study, one that any Siege of Petersburg aficionado will want to own." --Brett Schulte, editor of The Siege of Petersburg Online-- (10/15/2014) "For serious students of the Petersburg campaign of 1864, a new and exciting history of the battles of June 15-18 is now available. . . . With new discoveries included, the author has written an insightful, engaging, and eloquent narrative of the bungled Federal attacks during which Grant had multiple opportunities to capture Petersburg, Virginia." --James H. Blankenship Jr., historian -- (10/15/2014) "This book is a rarity among Civil War books. The writing is excellent. The research is top notch. And, best of all, Sean Chick has the courage to put the blame for the failure of the Petersburg assaults of June 15-18, 1864, where it belongs. This book deserves an award." 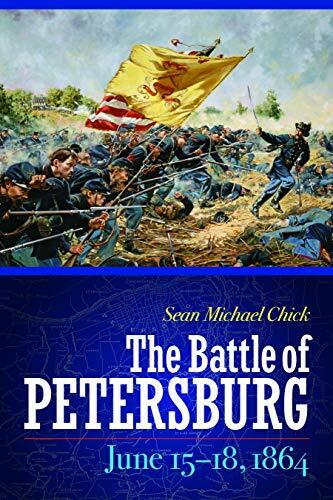 --Bryce A. Suderow, coauthor of The Petersburg Campaign, volume 2: The Western Front Battles, September 1864-April 1865, winner of the 2014 Douglas Southall Freeman History Award -- (10/15/2014) "Chick's assessments of the battles for Petersburg in June 1864 are well written and provide much needed detail on the often forgotten battles. For anyone studying the Petersburg Campaign, the book is a must." --Michael Hardy, Blue & Gray Magazine--Michael Hardy "Blue & Gray Magazine "
The Battle of Petersburg was the culmination of the Virginia Overland campaign, which pitted the Army of the Potomac, led by Ulysses S. Grant and George Gordon Meade, against Robert E. Lee's Army of Northern Virginia. In spite of having outmaneuvered Lee, after three days of battle in which the Confederates at Petersburg were severely outnumbered, Union forces failed to take the city, and their final, futile attack on the fourth day only added to already staggering casualties. By holding Petersburg against great odds, the Confederacy arguably won its last great strategic victory of the Civil War. In The Battle of Petersburg, June 15-18, 1864, Sean Michael Chick takes an in-depth look at an important battle often overlooked by historians and offers a new perspective on why the Army of the Potomac's leadership, from Grant down to his corps commanders, could not win a battle in which they held colossal advantages. He also discusses the battle's wider context, including politics, memory, and battlefield preservation. Highlights include the role played by African American soldiers on the first day and a detailed retelling of the famed attack of the First Maine Heavy Artillery, which lost more men than any other Civil War regiment in a single battle. In addition, the book has a fresh and nuanced interpretation of the generalships of Grant, Meade, Lee, P. G. T. Beauregard, and William Farrar Smith during this critical battle. Sean Michael Chick has a master's degree in history from Southeastern Louisiana University.